I can’t be the only one to have a box kid. I’m often sneaking out to the recycling bin under the cover of darkness to send packing boxes off to the next stage of their lives, only to see them back on the family room floor the next morning ready for crafting action. If this sounds familiar to you, you’re going to love the latest clever product from one of my favourites, Imaginabox! Imaginabox turns an unsuspecting box into something awesome, and in this instance, that kind of awesome is a cradle fit for favourite teddies, dolls, Mr Potato Heads and whatever else can fit into your cosy cocoon, which naturally depends on the size of the box. The Cradle kit comes with everything you need to easily transform a box into a cradle for hours of imaginative fun play and settling favourite toys for sleep. The fun doesn’t stop with a cradle though folks, there’s a car, train, oven and aeroplane kits also available. Suitable for children aged three and up, Imaginabox Cradle kit could possibly be the best Christmas stocking stuffer present going this year – especially when you take into account the sheer amount of box packaging there will be floating around between garbage and recycling bin runs! 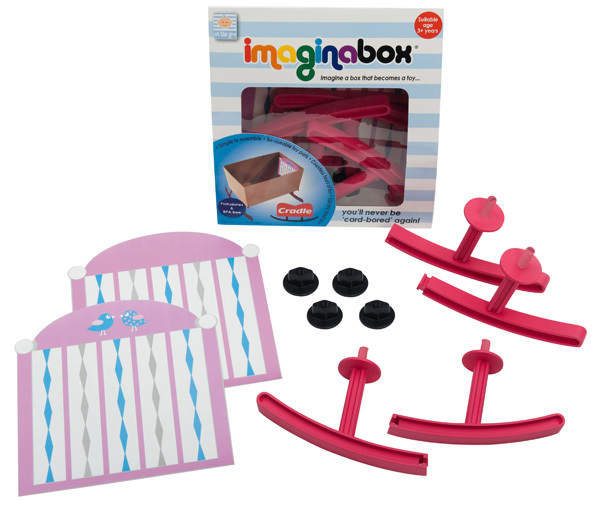 I don’t want you to miss out, so be quick to get your Imaginabox Cradle kit, priced $19.95 from On The Gro.